Donal Logue‘s resume is filled with memorable shows like The X-Files, Northern Exposure and the short-lived Terriers. He’s also had roles in films like Blade, The Patriot, Zodiac and Max Payne. But currently, he’s keeping busy with TV. This year alone, he’s recurring on three different but equally intense shows: FX’s Sons of Anarchy, BBC America’s Copper and the History Channel’s Vikings. ScreenCrave recently spoke with Logue about causing trouble on Sons, getting typecast, and the project of his dreams. It’s been confirmed that you’ll be returning for Season 6 of Sons of Anarchy. Have you started filming? Donal Logue: Right now I’m working on a show called Copper, and we begin filming Sons of Anarchy in mid-May. Kurt Sutter [SOA's showrunner] said that your character, Lee Toric, will be the bad guy. He was originally in law enforcement, but not anymore. He’s sort of a loose cannon. Donal Logue: I’m lucky because Kurt Sutter invented this incredibly cool character who is this really renegade, wild kind of rogue guy who has a military background. He’s basically got intelligence, he’s got skills and he’s got this incredible personal vendetta. His anger goes beyond wanting to bust these guys because he’s a cop and their robbers, or whatever it is. This is like The Outlaw Josie Wales-style personal revenge. What is he capable of? Donal Logue: We saw a little bit of it last year. He’s violent. There was a scene that we shot that was part of a montage… He’s in a hotel room reading really heavy literature while he’s got 15 high-powered weapons on his bed. I think he’s capable of doing harm in a number of ways, and he’s smart. He’s also not really tied to anyone. He’s not tied to local law enforcement or another criminal organization. He’s a pretty scary guy to have on your tail. The first season of Vikings is nearly over, and we just met your character King Horik. Is it true you had some trouble getting the part because you’re American? Donal Logue: I had difficulty because they left the casting ’til real late and I was doing an indie feature at the time, a little movie called CBGB. I couldn’t do Vikings, and Michael Hirst, the creator of the show, wrote to me and said, ‘Look, there’s a part that’s coming that starts at the end of season one that I have you in mind for,’ and I said, ‘Yeah that’d be great, I’d love to jump on.’ The role works for next season as well. The only tricky thing that it required Kurt Sutter to be such an amazing guy about the filming schedules. Speaking of schedules, how hard is it to be on three shows at once? Donal Logue: I had two years where I didn’t work a lot, mostly because I did something that owns you contractually or schedule-wise… You might sit for seven or eight months and not get to work. Just in case someone says, ‘Well that show that we didn’t think we’re going to do, we’re going to do.’ People won’t hire you if they think you have a chance to get taken away. So for Sons, that required a lot of goodwill on Kurt Sutter’s part to work out his show with Vikings. I did Sons and I finished season five, and then left the next day for Ireland to do Vikings. It was great. That was also a great group of people. It sounds so absurd and sometimes cliche but I’m so blessed right now ’cause I have a thumbprint on three very cool worlds. All of the characters you play, from Toric to King Horik and Brendan Donovan on Copper, seem very powerful. Is that intentional on your part? Donal Logue: As an actor, we have so much less power to choose. ‘Why would you choose this?’ Well it’s the only job that came along during April and June. It’s interesting but I do vibrate towards certain things and now they’re vibrating back towards me. There was a time when I did improv comedy for MTV in the mid-90s. Then all of a sudden, people would be like, ‘Oh that guy could do that crazy, wacky comedy, so that’s what he does.’ And I didn’t blame anyone for this. But those would be the jobs you’d get offered, and they start thinking about you in that way. Then you have to do something at another point that allows you to be seen in a different light. It happens with a lot of people. It’s funny because before The Shield people wouldn’t of thought of Michael Chiklis as Vic Mackey, or Breaking Bad and Bryan Cranston. I look at those guys as kind of examples and inspirations. You’ve been added as a series regular on Copper, which is set in the 1860′s and focuses on the Five Points neighborhood of New York City. How did you get the role of General Brendan Donovan? Donal Logue: Copper, basically was on a Thursday afternoon when they asked me, ‘Can you start Monday morning on this show?’ And I was aware of the show. I had watched the show and was a fan of the show. I remember in the past thinking that that was a cool world. Tom Kelly, who’s now the showrunner, he, Tom Fontana and Barry Levinson probably kicked my name around and probably made some background check on me, just to check [to see] I was an alright person. That happened very quickly, so I was lucky. We don’t know a lot about your character because we haven’t met him. Can you give us some background info? 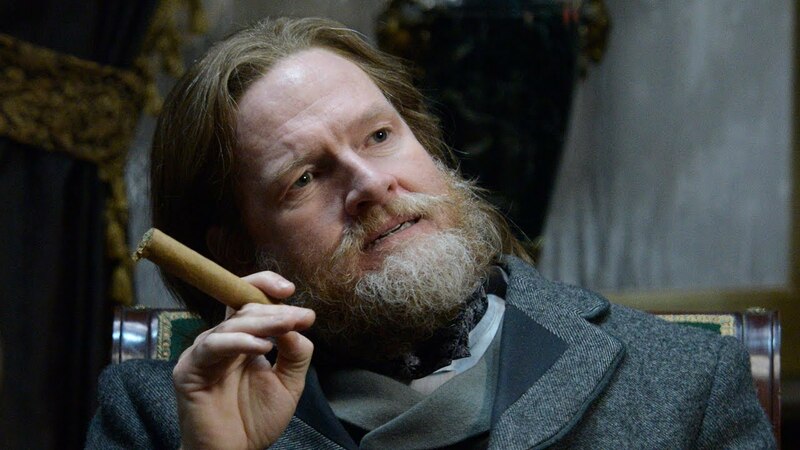 Donal Logue: Well after the Civil War in New York’s Tammany Hall, there was a guy called Boss Tweed who really solidified the power of the Irish-American. It’s almost like an early version of Al Capone in terms of politics and corruption but did some good too. He worked through the police force and the political system to gain power. My character Brendan Donovan comes back from the Civil War and steps right back into this political system in the upheaval of New York. Right after the Civil War, he begins to solidify his power and using the massive influx of Irish-Americans. The Irish, had migrated to America to use the political system to their advantage. Back home in Ireland they had no political voice. So when they first got to America and were looked down upon, they thought, ‘Well, we don’t want to come here and have a bunch of rich, white English Protestants tell us that we have to live in servitude again,’ which may or may not have some element of truth to it. Then Tammany Hall was sort of the result of that. I play a mentor figure to Tom Weston-Jones‘ character of Kevin Corcoran. So you’ve been doing a lot of period-pieces on TV. If you had the power to choose, where would you like your next project (whether it be TV or film) to be set? Donal Logue: It’s so funny because I was a history major and I loved it so much. They just made a find today under the Sea of Galilee of this thing that could be the walls of an Ancient City. It could be something, but it’s maybe 4,000 years old. As a human being I would be fascinated to have been in that part of world, to live at that time or even 3,500 or 3,000 years ago. I have a weird feeling/suspicion that there was a lot more integrated traveling commerce than we think in the world. I’m so fascinated by the development of civilization, and we certainly have a lot of clues. But with the Phoenicians and the Syrians and the Egyptians, that’s one. I know that’s a broad answer. I do think that something like a very gritty drama set during the early 1770′s in what is now the United States. I think a pre-Revolutionary War drama would be an amazing thing. It’s so hard for us, as Americans, to think of Boston as a city with 15,000 people standing up to the British empire or people who considered themselves to be English at that time anyway. Just something that gave a more in-depth look at the political birth of the United States of America and the Revolutionary War. The Vikings finale airs Sunday, April 28th at 10 p.m. on History. The second season of Copper premieres on June 23 on BBC America, and Sons of Anarchy returns later this year to FX.